Our review of Ocean Resort Casino Sportsbook discusses everything from its hours of operation to its wagering options, restrictions, and ways to place a bet. It is our goal to ensure you fully understand everything this venue has to offer and why you should choose this bookmaker over any of the others in Atlantic City for legal sports betting. Ocean Resort is a brand new casino and with that came a state of the art, fully built out sportsbook lounge to accompany it. The resort wasted no time building one of the best sportsbooks in Atlantic City and they did they by not cutting any corners. As the first Boardwalk property to offer sports betting and second overall in the city, many people flocked to its location and were immediately impressed. Mark Wahlberg attended the grand opening becoming the first person to take action at the lounge, putting money on the Patriots to win it all. The lounge is very easy to find within the casino, unlike many others in the country, and you just have to look for the huge sign that says “Bet Sports Here”. When Did Ocean Resort Sportsbook Launch? The casino itself is brand new and opened on June 27th, 2018 but it wasn’t until the high tech lounge was opened that sports betting really took off here. The state of New Jersey was finishing regulations for the industry after a long battle with the Supreme Court to overturn the federal ban of single-game wagering in the country. The casino offered a few cashier windows to accept bets to start as they finished their project but it wasn’t until August 31st, 2018 (just in time for football seasons) that the lounge was open for business. Where Is The Ocean Resort Sportsbook Located? How Old Do I Need To Be To Bet At The Sportsbook In Ocean Resort Casino? State laws require that players be 21 to enter not only the sportsbook but the casino as well. It is recommended not to attempt to wager underage as New Jersey takes this law very seriously. For those of legal betting age, consider joining the Sports Reward Club, where you will receive points for every wager you make. Straight bets earn you 1 point per dollar spent while parlay cards earn you 5 points for the same amount. Redeeming points is easy and you will be on your way to earning free play in no time. Does Ocean Resort Sportsbook Offer Full-Service Sports Betting? Ticket seller as there to not only take your action but also help you with any question you may have. However, the lounge accepts all types of bet you would find at a single-game wagering venue in Las Vegas. From a straight bet to futures bets, parlays and more, there are many choices you have when looking to play the odds. The only restriction is the inability to wager on New Jersey collegiate athletic events, whether they are played inside the state or not. This is a state law and there is no getting around that unless you use an offshore sportsbook. William Hill is the partner for the mobile wagering at Ocean Resort Casino. Accessing their mobile webpage from your device is easy and provides the same luxuries you would find in their lounge. The betting options and lines are exactly the same giving you the ultimate convenience to wager on the go. The only restriction is betting outside of New Jersey state lines as they geolocate your position to determine if you are capable of making a bet. This is just a standard as federal laws require it; however, if you are a gambler who likes to travel, consider an offshore sportsbook, which has no position restrictions. This is the next level in terms on sports betting as live in-play betting allows for you to take action of a game after the event has already begun. The odds and betting lines are changing at every second as Ocean Resort Sportsbook reviews the games as they happen. Payouts can be quite luxurious if you come across the right odds at the right time and make watching the game even more interesting. What Promotions Does Ocean Resort AC Have? Monthly promotions are what keep people coming back to Ocean Resort, aside from their amazing amenities. You can always expect there to be a slot free play and cash giveaways multiple times per day over the course of a few days. For March, check out their $100,000 Pot O’ Gold where every 30 minutes on Saturdays will see a lucky winner receive $1500 in free play or $3500 cash. How Do I Sign Up For An Ocean Premier Card? Whether you are looking to join the blue, gold, platinum, or black tier, just know that the Ocean Premier card is free and delivers many benefits. Becoming a member is simple and you can even sign up online. Benefits include the removal of expiration dates on your comps, premier lounge access, room upgrades, celebration gifts, and more. Earn credits and comps even easier as you increase your free play bounceback and double your comps just for signing up for the blue tier. 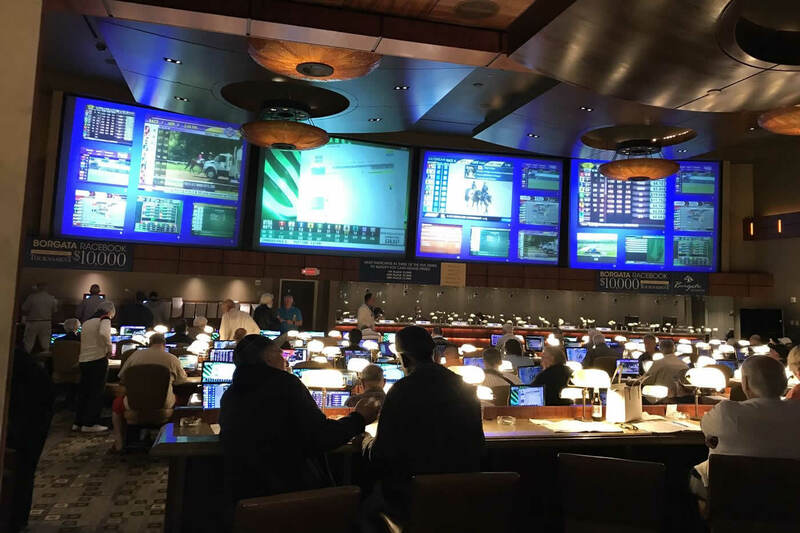 What Is The Parlay System At William Hill Sports Book At Ocean Resort AC? Off the board parlays are made simple at Ocean Resort AC due to their partnership with William Hill. A payout of 2500-1 is the max you can win so don’t bother adding more variety if you have twelve or so teams. Betting on 10 teams will payout 720-1 if you take your wagers off the board; however, for wagers on the moneyline, your odds can drastically change. Consult a cashier before submitting your wager to understand your payout.